The word zeppoli is Italian dialect for zeppola (the plural is zeppole). Zeppoli are deep fried dough balls or fritters that can be made savory or sweet and are often made on Saint Joseph Day in various parts of Italy (made specifically as as sfinge or a cake on March 19th). Our family, which hails from Calabria, prepares zeppoli as a savory bread during the Christmas holiday (primarily on New Year’s Eve and Day). We make a plain and a fish filled variety with salty anchovy (click here for my introduction to anchovy ).Italian-American’s have come to embrace and love zeppoli and most Americans prepare the fried delicacy as a sweet topped with powdered sugar (found, for example, at Italian American street festivals or feasts). At times, zeppoli are refereed to as funnel cake, Italian doughnuts, etc. In Italy, zeppoli are consumed mostly south of Rome (specifically, in Naples, Sicily, and Calabria). I’ve always loved zeppoli especially when made fresh and served piping hot from the fryer. 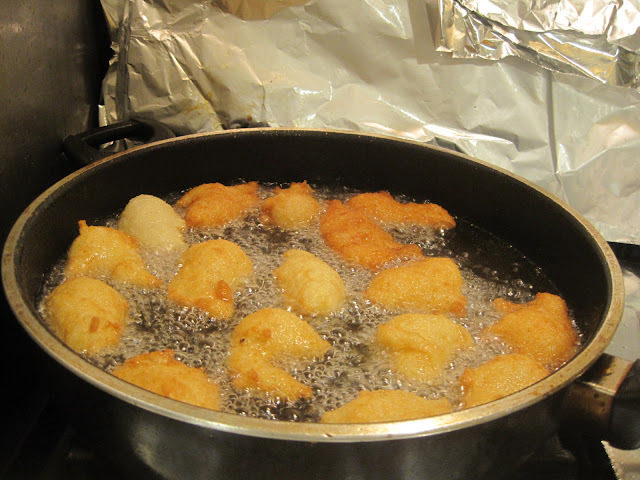 Some of my fondest memories include frying zeppoli in my grandmother’s, New Jersey, basement on New Year’s Eve morning. The following recipe is derived from Nonna Rosa Scordo. A few readers have asked if the associated sfinge is similar to zeppole. The short answer is that sfinge seem to be a sweet fried product that is often sprinkled with honey, sugar, or cinnamon. Sfinge batter also differs in that it contains ricotta, sugar, and vanilla. Zeppole dough is very loose and requires the right touch to get the consistency correct. You're looking for a wet yet clingy texture. my mother frying zeppoli in her basement; notice the aluminum foil used to guard the appliances, counter top, and stove! 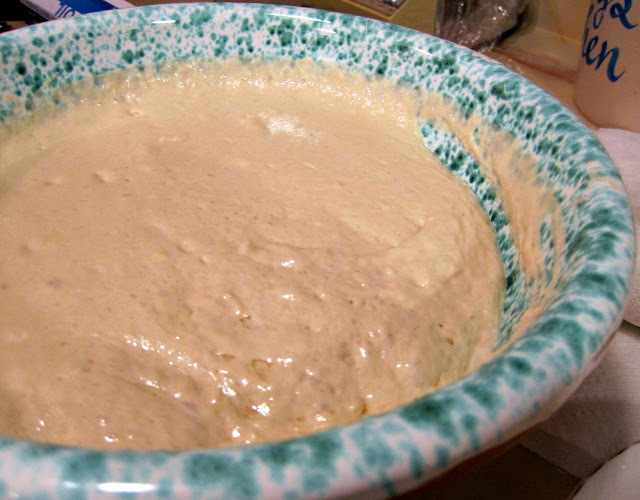 Combine and mix the flour, salt, yeast, and water in a large bowl. Thereafter allow the dough to rest and rise for 2-2.5 hours; the dough should be soft to the touch (remember you’re not making bread dough which is usually a bit firmer). At this point you’re reading to shape your zeppoli which is simply pulling the dough into individual pieces. Place a single anchovy, if desired, into the center of your zeppola and fold dough over to make a ball. As with any recipe that include deep drying heat your oil to roughly 350ºF (use a large pot) Carefully drop the zeppoli into the hot oil and cook until golden brown (making sure to turn the dough balls to ensure even cooking). Consume the zeppoli immediately, preferably with homemade wine (click here for my guide to making homemade wine). I feel I want this, even though I’m vegan! Your food make me hungry. This make me think about fried banana and put icing sugar on top, eat with ice cream. Also nice with a ricotta/flour batter (a.k.a. ricotta fritters) although maybe just for sweet zeppole rather than savory. Love the aluminum foil… although your mother is braver than I, because as careful as she is to protect her kitchen surfaces, her forearms are bare. That hot oil sure burns when it splatters on your skin. A light and careful hand with a slotted spoon sure hleps. 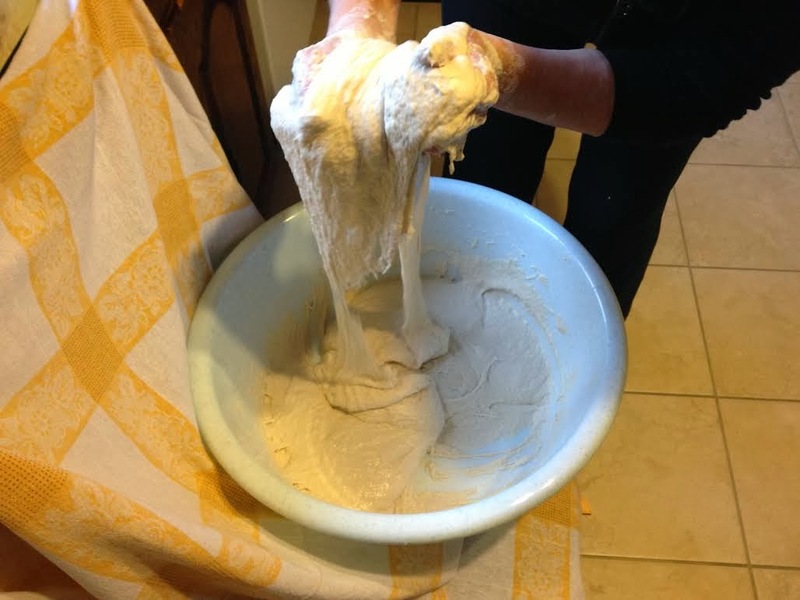 (photo: courtesy of Dr. K. – loaves of Enna bread from Sicily)The following Pagnotte di Enna recipe was adopted from theArtisan.net web site who adopted their recipe from the book, Scienza e Technologia della Panificazione by Prof. Giovanni Quaglia…. My aunt Rosa Scordo from Argentina also makes the same for Christmas, love them! My Mom was from Sicily…She made these all the time even made them sweet with chocolate chips…She also made the zucchini fritters all the time…made with all different veggies too. Wow, chocolate chips (good idea!). Another original native born Calabrese here. Once cooled, they can also be drizzled with liquid honey. My Mother was born in Calabria & would make these every New Year’s Eve! Of course in her basement back in New York as well. She never wrote a recipe down & when since she passed away 3 years ago I have been searching every where for this recipe and trying to make them! Every one I found made it the sweet way but she made it exactly like this including the anchovies for my Dad. Mille Grazie for this recipe! I can now carry on my Mom’s tradition. When I combine the 1 1/2 cups of flour, pinch salt, package of yeast and 3/4 (100°f) water my mixture is dry, not wet like your. Am I suppose to not put all the flour in the bowl to see I need all the flour? My fried dough looks rough and bumpy, not smooth like yours. Why? They dont golden up nice either. so many fond memories when my mother used to make these. she used her hand as ladle to drop the zeppoli into the oil. my question to is how many zeppoli does your recipe make and do you let the yeast and water sit before adding the flour? yes, you can let the water and yeast sit a bit. I don’t have an exact amount but you should have enough for a large party. The yeast must be dissolved in the 3/4 cup of warm water first (not hot). Combine and mix the flour, salt first, and THEN add the water with the dissolved yeast to the mix. Allow the dough to rest and rise for 2-2.5 hours, covered with a dish cloth in a room temperature location. DO NOT RERIGERATE! Proceed with the remaining steps of the process from here. Cook just a couple of minutes per side. Until they turn golden in colour. Is this the same recipe they use in the feast’s in New York? How long do you fry it? I made it last weekend and over cooked it 🙁 I don’t have a deep fryer so I’m doing it just on the stove with oil. Thanks! Just a couple of minutes per side. Until they turn golden in colour. I believe that those are called PETTOLI. My Italian aunts’ (from Areinzo-near Naples) recipe included 3 beaten eggs and 1 cup scaled milk, I stick butter- and add figs, dates, and nuts. Roll in powdered sugar if desired. We ate them on Christmas eve and served with LOTSA LOVE! Looks like your zeppole are the sweet variety – they sound great! Our family has only made the savory version which we also eat during the holidays. Hello, my grandmother, who was born near Naples, used to make the most delicious Zeppole. Your receipe is most like hers. My question, back in the day, did they use another kind of oil or lard to make these? I look forward and appreciate your response. good question, I’ll do a bit of research and get back to you. My mother made these every year but no one had the recipe. I tried these and the first batch was to thick and they came out heavy. I tried a second batch and added a little more water, it rose and it was loose but when I went to fry them they were still thick and heavy. My mothers were light. What am I doing wrong? they are difficult to make; what does the solution look and feel like before you begin to fry? How long are you cooking? Is your oil at the right temp? Couple of questions…..Is the measurement of 1 1/2 Cups of flour accurate? Can the recipe be doubled? Is there any reason why the anchovies cannot be chopped & mixed in with dough at some stage? Many thanks. Looking for a reply. Any help available to post above? Scordo- Can you favor me with a reply??? Hi John sorry for the late reply. 1.5 cups of flour should be correct. I’ve never doubled the recipe, but you can try. You can chop the anchovies though you may get too much of an anchovy flavor versus a nice delicate piece with each bite.